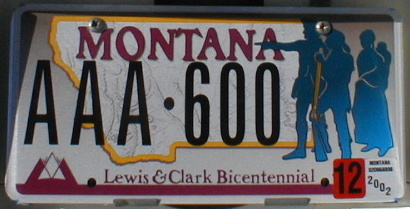 This is the new Lewis and Clark Bicentennial (Optional Issue) This plate is available beginning January 2nd 2002 and costs an additional $30 for the first year and $20 per year after that...The plate is flat screened as opposed to embossed and primary colors are purple, grey, blue and yellow outline of state map with black serial. 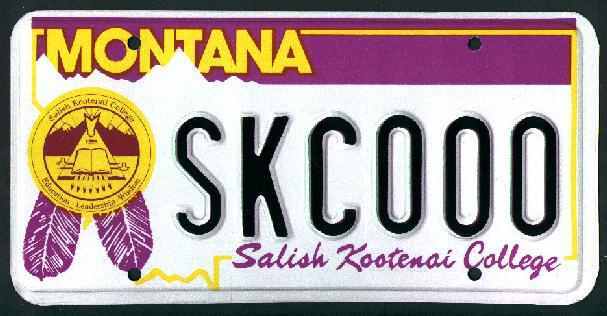 The plate pictured here is the one on my Cadillac. 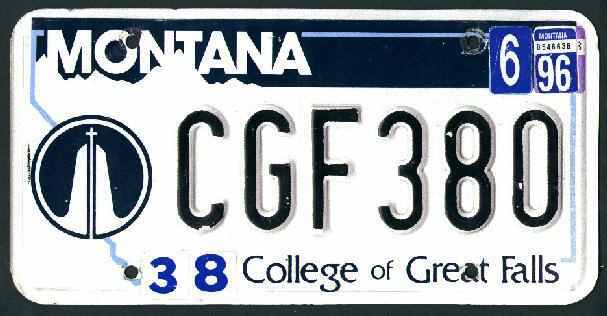 This is a brand new special issue plate which started becoming available in Feb 2002. 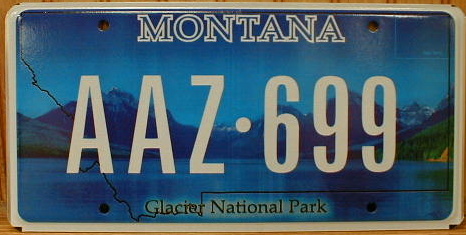 A $20 per year donation goes to the Glacier National Park fund. 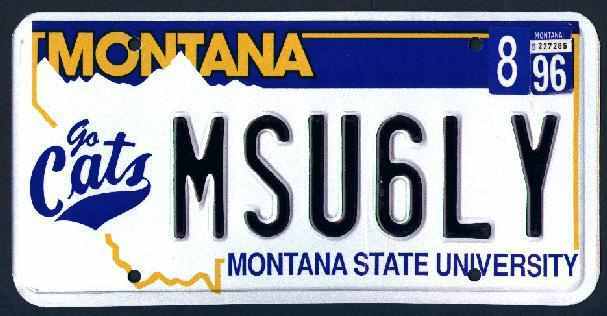 In addition to the $20 annual fee a one time administrative fee goes to the State of Montana upon initial issue. 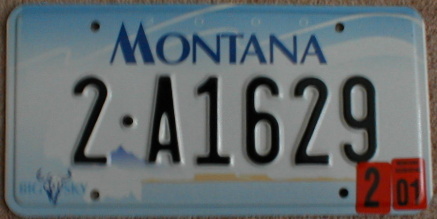 The plate is flat screened like the Lewis and Clark plate above and is white on a mostly blue with some green background. The background design is a beautiful moutain scape. Unfortunately this image doesn't show the white very clear, it looks more like cream. 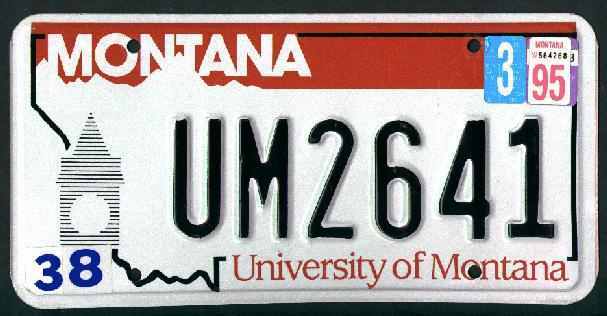 These plates cost an additional $30 at time of registration and can be ordered in a personalized format of up to six characters for an additional $23. 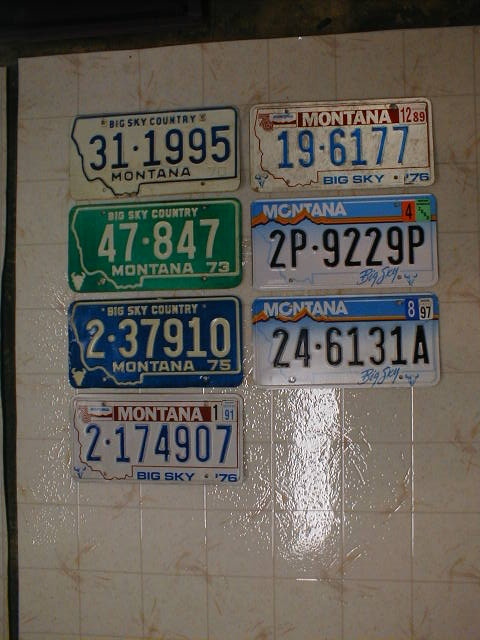 Here is a look at some of Montanas license plates. 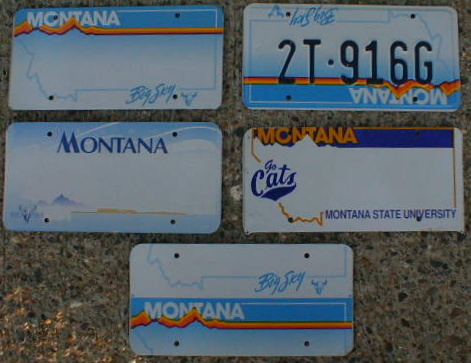 This first group of plates are the current 2000 issue Montana license plate which started being mass reissued to all Montana motorists in March of 2000. 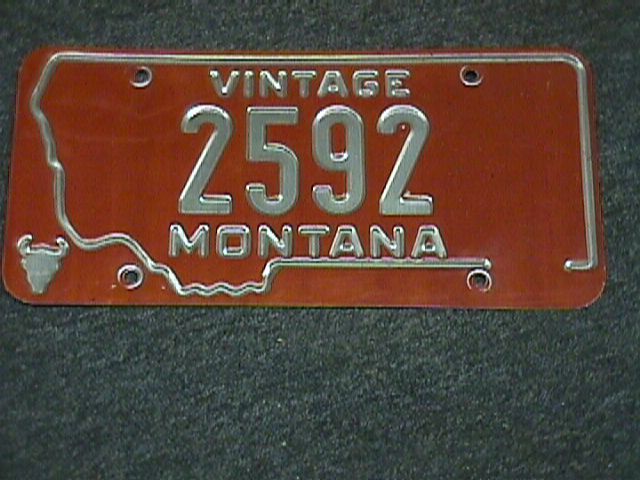 This is a general issue 2000 passenger base... All Montana general issue plates have the county # first followed by a dot divider which is inturn followed by a single alpha character to begin the serial and any number of numerals from 1 to five following the alpha designator..Truck plates are identified with a "T" which follows the county #. 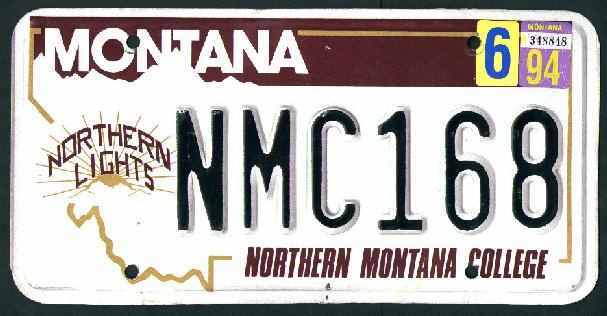 The next photo is a group of my former vanity plates on the previous "Big Sky" graphic base, which began issue in 1991 and a few are still on the road today slowly but surely being phased out by the 2000 issue. 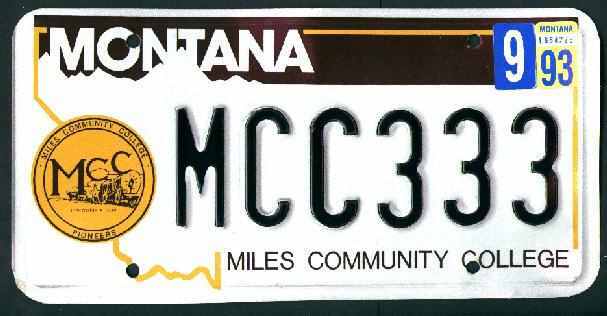 On the Big Sky issue, general issue passenger plates were identified with a "P" for passenger following a single county identifier 1-9...On plates with higher county numbers such as 26 no "p" is used. 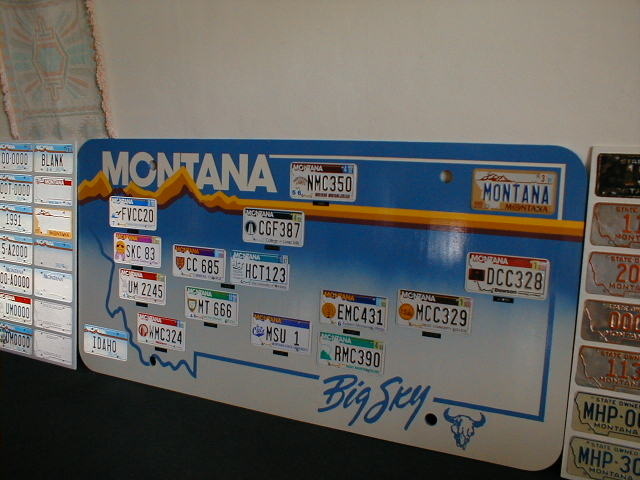 Passenger plates have long been identified differently from TRUCK plates. 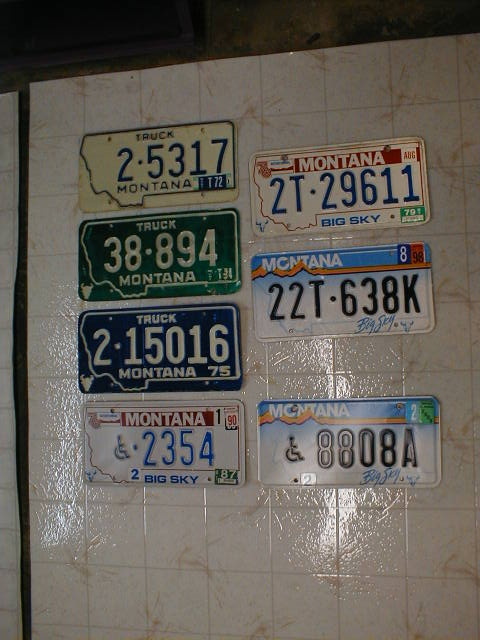 In years past the logo BIG SKY COUNTRY across the top of a plate identified a plate as a passenger plate rather than the word TRUCK (as is the case with the blue on white 1970 base and the white on green and white on blue debossed 1973 and 1975 bases in the photo. 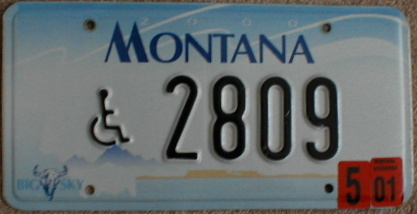 Passenger plates are issued to most vehicles with more than one seat. 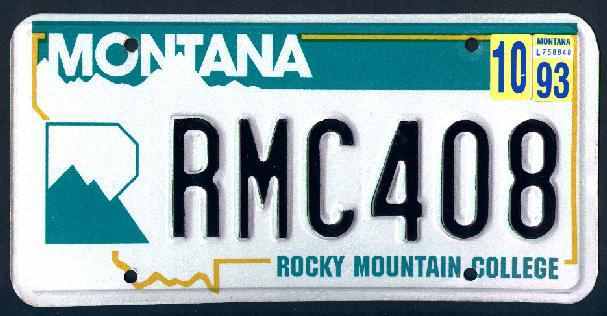 Truck plates are issued to most vehicles with only front seats with the exception of extended cab and crew-cab pick-up trucks which are of course issued "truck" plates. 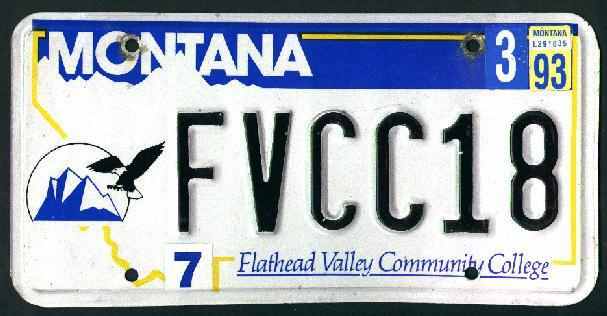 Typically Vans and sport utility vehicle are issued passenger plates. 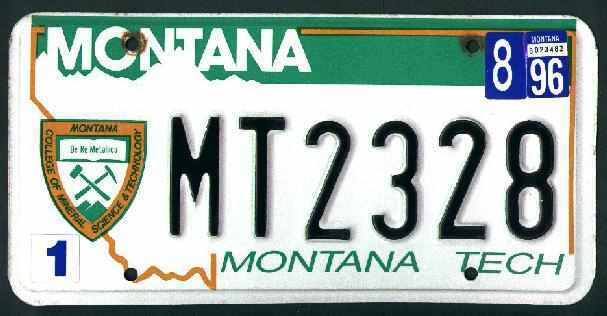 Passenger and truck plates are identified by the "P" (passenger)or "T" (truck) following the county number. 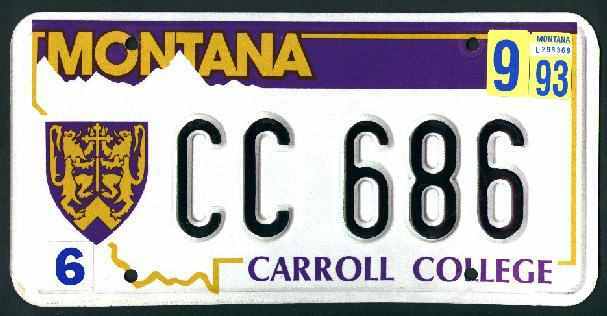 There are a total of 56 counties in Montana. 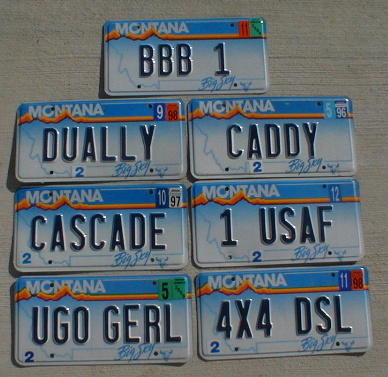 Counties numbers from 1-9 are followed by a "P" for passenger plates but county numbers 10 and higher just have the county number followed by a dash and the serial. 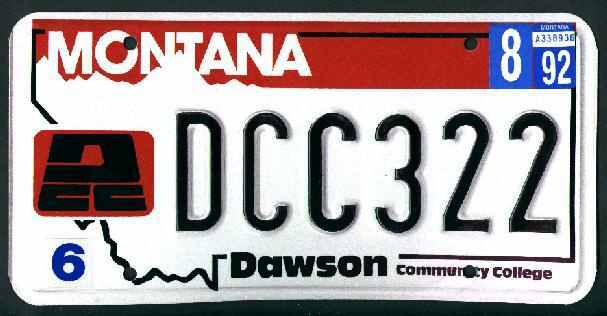 All "truck plates have the county number followed by "T" for truck regardless of the county number and then the dash and serial.